We are delighted to announce that the students of l’Observatoire have been invited to exhibit their works at the French Bookshop in Tiong Bahru this June. Join us for our vernissage on Sunday 8th of June, 12noon – 2pm, meet some of the young artists, and sign our book! I am happy to announce that I will be running Drawing Workshops at the ArtScience Museum for their Dinosaurs: Dawn to Extinction exhibition which opens later this month! Bring fossils to life by drawing them in detail. Observation drawing . Make your piece stand out by placing it in a pre-historical landscape (optional collage). Ammonite or Fossilized wood will be our inspiration. What better way to understand a fossil than to feel it in 3D? 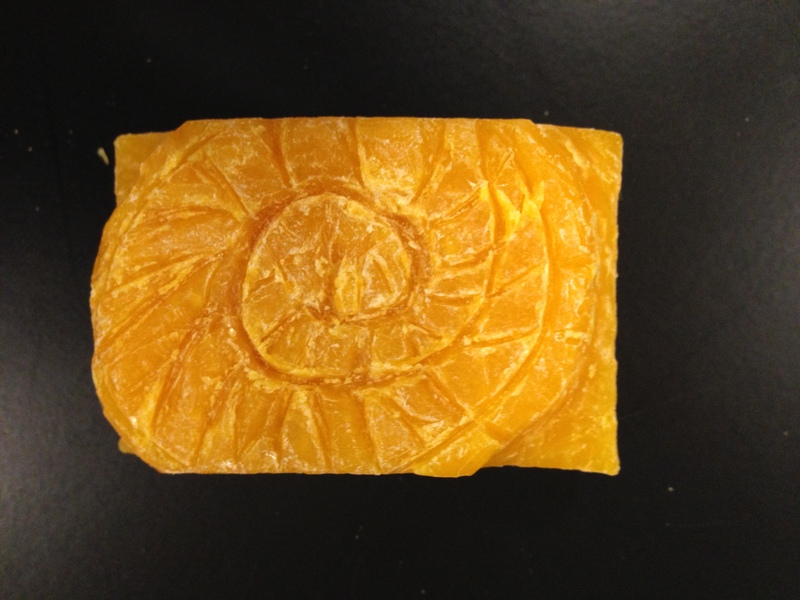 Carve your own sculpted shell or bone out of soap, and bring your replica home. Children under the age of 8 require adult supervision. 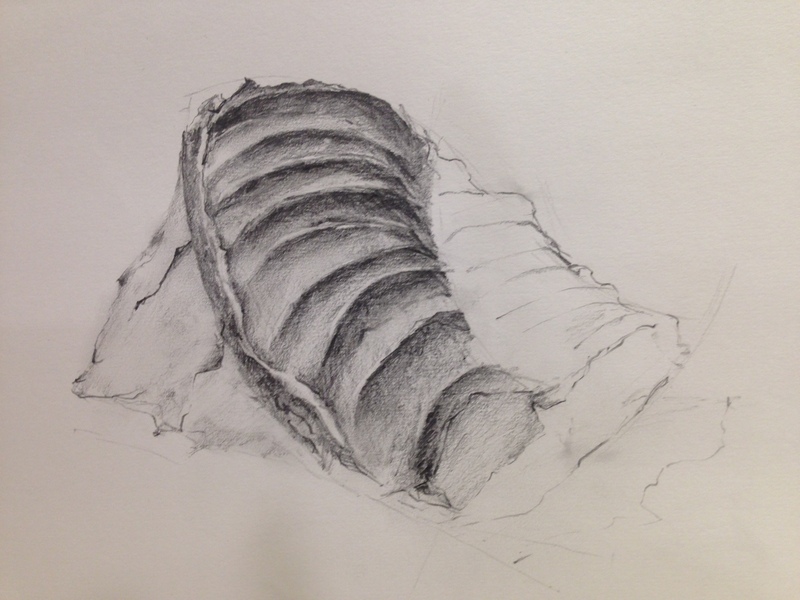 Ammonite or T-rex claw will be our inspiration. As most of you might know by now, “Isadora’s Workshop” is the crafty sister of “l’Observatoire”, an art-and-science place. This Christmas Season, Isadora’s Workshop’s craft is happening at l’Observatoire where we are are mustering all the craft we can to bring some cheer to as many people as possible. Come and make your Christmas cards, Christmas decorations and Christmas presents in a convivial atmosphere – all proceeds go to the Philippines Red Cross! So don’t delay, Come and join us this Sunday or any Sunday before Christmas, either as a volunteer, as an artist/maker/crafter or as a participant! A new hospital is being built in Jurong. And I was called in to help produce an artwork for the hoarding lining the new Jurong Gateway Road (don’t look for it, the street is not yet on the maps. Hint: it’s opposite the IMM building) while the hospital is being built. This hoarding was a perfect setting for a community project. So, students from several Jurong primary schools as well as secondary schools and JC were involved, as well as people from St Luke’s Old Folks’ home. To fit with the building, the theme of “Build a Picture of Health” was proposed. How do you make over 80 participants help in a large drawing? I decided I would draw a setting, representing different parts of everyday life, from Home, to Outside (in Town or in the Forest), the Community Park and the Hospital. And then, I would ask the participants to produce drawings relating to “Picture of Health”. My job would then be to fit their pictures in my drawing. During the workshops, after an introduction on the hospital, I conducted a brainstorming session on the theme of “Picture of Health”. This was to get the participants to expand on the meaning of health… and we did get beyond the “eat an apple” to stay healthy. I wanted the students to walk in unprepared. I did not want them to do research ahead of time. This was a spontaneous exercise. Students were invited to use their favorite medium. Some like to paint big pictures. Some are more comfortable with a small pencil sketch. All was possible, but the theme was defined, and I walked among the students, helping them decide what they would do. In the end, some students produced some of the backdrop, some produced inspiring images that end up being hung on the walls of the different rooms I drew. Some wanted to paint “beautiful images that they would want to see if they are sick and need to get better”. Some drew settings that allow for healthy lifestyle. Finally, some of the images were selected to be finished by the elderly from St Luke’s Old Folk’s. For those images, the participants were given the choice of coloring the vignettes either with paint, or with seeds, producing a beautiful effect. The students from my workshop at l’Observatoire also participated. And after a time of discussing all the elements that fit into a Picture of Health, they took to painting a number of pictures too. In the end, I had to put this outpouring of over 80 images into a 50m-long image. Needless to say, there was a lot of back and forth deciding what the background would be like, and then where each image should fit. Finally, here it is, as it was sent to the designer at the beginning of the month… they have made it into a very long sticker, interspersed with text and other images relevant to the hospital. Here, I would also like to add a few of the pictures contributed by the different participants of the community. Can you find them in the picture above? If you find the picture is too small, why not go and check out the hoarding in person? It measures 2.5m in height and is 50m long… surely there, you can spot your picture! With the drawing classes winding down and the drawing year coming to an end, I have decided it was time to revive this blog by posting regularly about the various themes we have been exploring throughout the last few months. 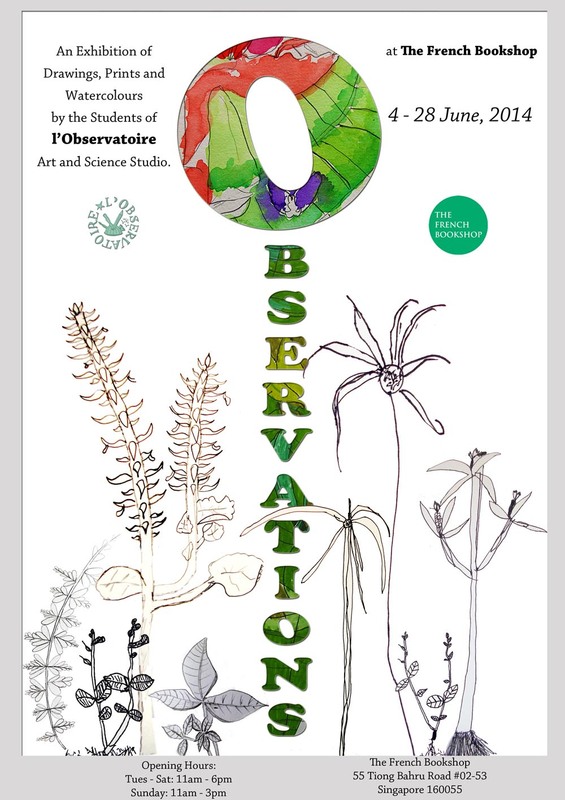 Students at the Observatoire studio range from 5 year olds to teenagers (and the occasional adult), and in most weeks, there is a theme, that will be interpreted in various ways by the different drawing groups. The results are as varied as you can imagine and sometimes throw great insights into how students of different personalities, different age, and in different environments (peers) produce different drawings. A house. 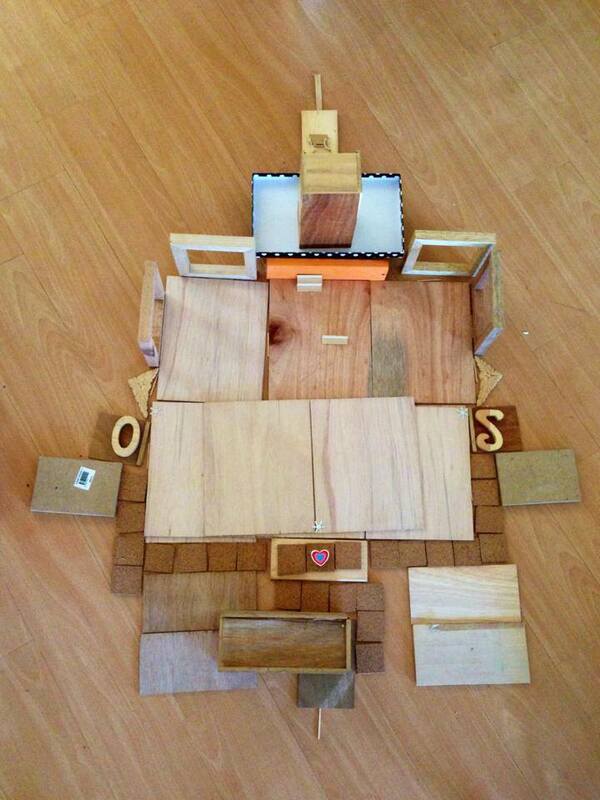 Built by 5-year-olds Henry and Breit. How to draw an apple accurately enough that you might be able to pick it from a bowl? Drawing water bottles. Is it boring? Build your own house and draw it. Observing insects close-up. Drawing them accurately. Understanding Master’s paintings through their mark-making. I will update the list above with links as the posts come in… stay tuned and do link-up on Facebook where I do post rather informally drawings of various students or comments on classes as they have just happened. Due to the high demand for the Drawn to Nature Camp, we are opening the camp for a SECOND WEEK from 17 to 21st of December. Sign-up soon as these fill up fast! Call me first to check availability (9273 4991) and fill up the contact form at the bottom of this post so I can send you the registration details. There are still places for the PRINTMAKING session on Thursday 20th December afternoon. Call me first to check availability (9273 4991) and fill up the contact form at the bottom of this post so I can send you the registration details. I hope to see you before the year ends! School’s out and kids want to do things. This year, all holiday activities take place at the new Observatoire at the Blue House in Bukit Timah. You can sign up for Printmaking for one afternoon or morning (and come home with a set of Christmas cards) in December, or you can sign up for a week of Drawn to Nature camp (Observing nature and drawing inspiration from it) from 10th to 14th of December. Either way, make sure you visit soon! Always wanted to try drawing but think you can’t? Here’s the news: if you can write, you have enough control to draw. If you can see, you can learn to see to draw. Drawing, together with writing and counting is a tool for communicating and understanding the world around us. Come give it a try over the next 5 weeks. First class is on the 23rd of September, at the brand new Observatoire at the Blue House. Full details here. We moved to the Blue House! We are now part of the Discovery program of the Blue House International School! With a new space and a new studio, it means that Isadora’s Workshop is becoming l’Observatoire, an Art and Science place. Head over to the new website (still in construction, but with basic info) if you want to sign up for Drawing Classes, Tinkering Sundays or the famous Holiday Camps (Next one is coming up at the end of October). We will be located near Turf City in a fantastic environment. Do come and check us out! I will still be the main instructor for all the classes, but artists, engineers, tinkerers and scientists will be regularly invited to contribute. 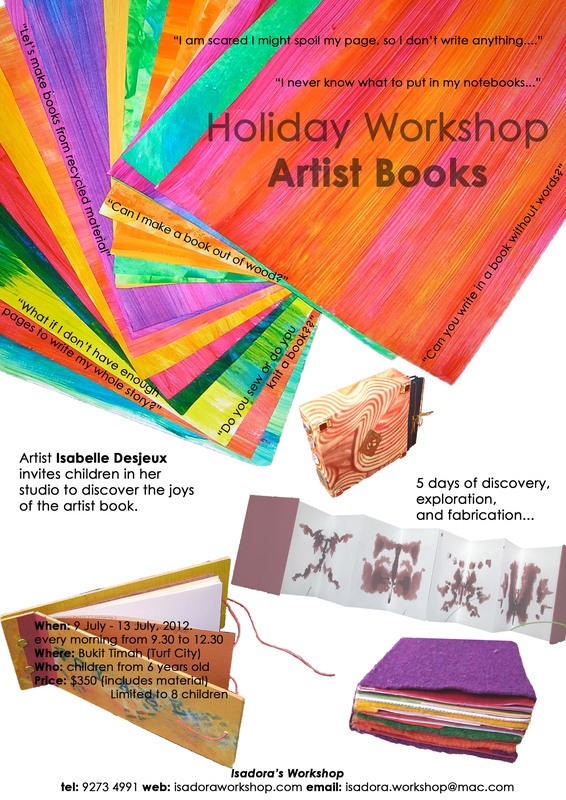 Making artist books – July Camp! Most places at the Explorator/Robinson Crusoe camp have been taken up for July, but there are still spaces available for the Book-making camp! Come spend a week discovering how to make books. From building the structure to filling it up. Whether to sketch, write down ideas, or keep notes, many different people keep books. In this camp, we will explore what “BOOK” means to us, and find many different ways to expand on the definition. Run by artist-scientist Isabelle Desjeux, these camps provide structured time to learn a skill and open time to discover and perfect personal interests. A guest artist will make an appearance, providing a different perspective! Making friends is also a great part of the camp and we invite parents to join us on the very last day, from 11:00am onward to come and view an exhibition of the works, and meet the new friends. Bring some food to share and we’ll have a picnic. WHERE: l’Observatoire @ Bukit Timah Turf City. Summer is upon us. Although there will be no camp this June, there will be two new camps this July, and two more in August. The number of participants is limited to 10, so make sure you sign up early! In line with the new direction taken by Isadora’s Workshop, there will be more tinkering, more science and more discovery in these completely unique art-based workshops. Another novelty is that guest artists, scientists or tinkerers will make their appearance, giving the whole workshop new momentum. Art needs inspiration, so we are going out to get it, and coming back in to do it! If you want to look at past workshops, check here. Come be a Robinson Crusoe for a week. Learn basic skills for the outdooor. Rope lashing, map-making and navigating, making objects from wood (wood-carving), documenting the world around you… Being an artist in the wild can be hard work, but is very rewarding! Making friends is also a great part of the camp and we invite parents to join us on Friday, from 11:00am onward to come and view an exhibition of the works, and meet the new friends. Bring some food to share and we’ll have a picnic – outside if the weather permits. Come spend a week re-discovering the ancient art of printmaking. From using naturally-collected material like leaves or wood to new recycled materials like milk-cartons, foam or lino, you will be given the opportunity to try different techniques and experiment with your own. Each participant will be given ample space for exploration and the opportunity to pursue their favorite medium. 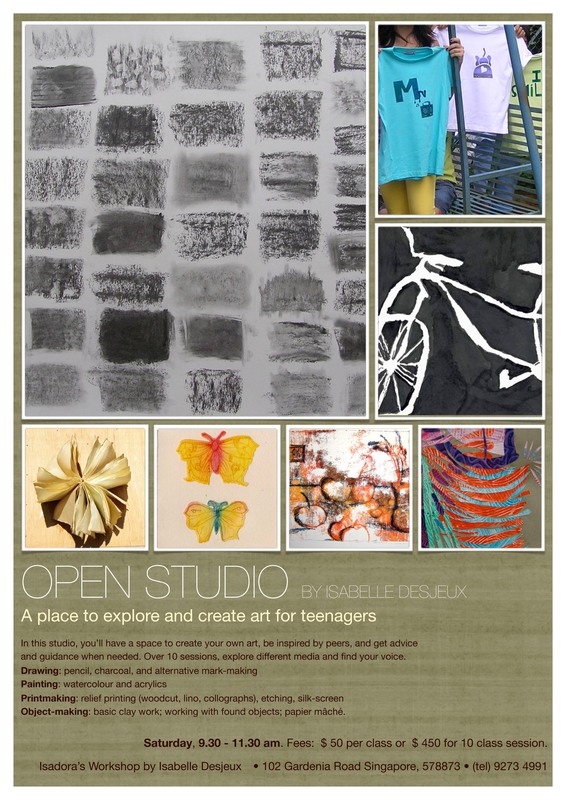 A place to explore and create art for teenagers. In this studio, you’ll have a space to create your own art, be inspired by peers, and get advice and guidance when needed. Over 10 sessions, explore different media and find your voice. 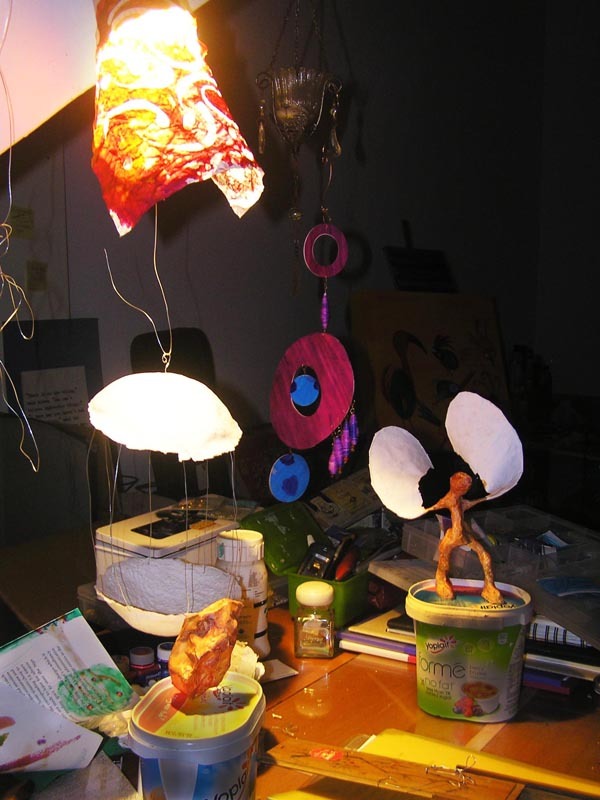 Object-making: basic clay work; working with found objects; papier mâché. Saturday, 9.30 – 11.30 am. Fees: $ 50 per class or $ 450 for 10 class session.